Saltillo Family Career and Community Leaders of America competed in FCSA contest at the State FCCLA meeting on April 4th-5th, 2019 at the Sheraton in Dallas, Texas. 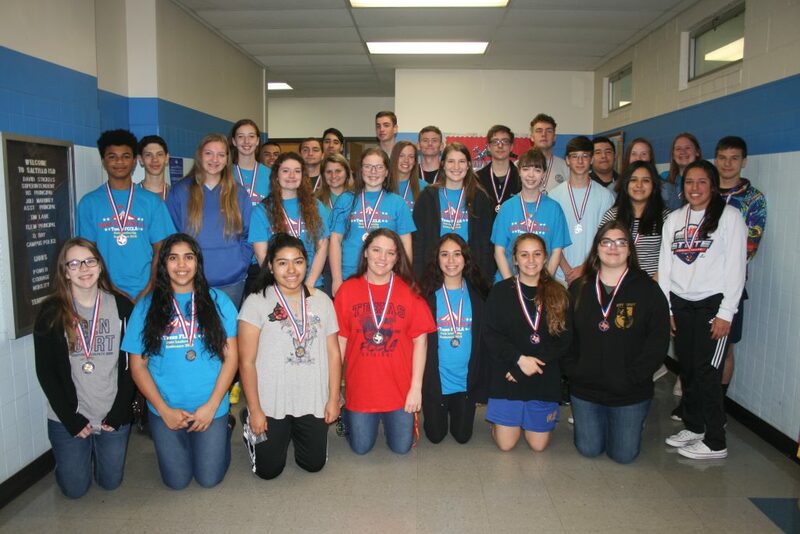 Students brought home 13 Gold Medals – Trinty White, Bianca Castro, Graycie Hodges, Lindsay Butler, Daniel Gonzalez, Ofelia Cabrera, Maddy Smith, Jocelyn Ochoa, Edi Olayo, Lorena Castro, Anna Reeder, Matthew Gurley & Christy Marquez; 9 Silver Medals – McKenna Gurley, Melissa Tawil, Evan Andrew, Seth Crosby, Levi Hoover, Brittney Peeples, Chris Boekhorst, Ally Smith & Garrett Tarver; and 8 Bronze Medals – McKenna Wiler, Hannah Wartenbee, Paisley Kastner, Kristina Wade, Steven Marroquin, Andrew Redburn, Cale Hoover & Brianna Tawil. Pictured Kneeling L to R: Lindsay Butler, Olfelia Cabrera, Bianca Castro, Trinty White, Jocelyn Ochoa, Brianna Tawil & Hannah Wartenbee; Standing L to R: Andrew Redburn, Evan Andrew, Elena Heukals, Brittney Peeples, Edi Olayo, McKenna Gurley, Seth Crosby, Steven Marroquin, Melissa Tawil, Paisley Kastner, Anna Reeder, Chris Boekhorst, Matthew Gurley, McKenna Wiler, Cale Hoover, Graycie Hodges, Levi Hoover, Garrett Tarver, Daniel Gonzalez, Ally Smith, Lorena Castro, Maddy Smith, Kristina Wade & Ben Moore. Not Pictured – Christy Marquez.